Samihas Song is Mary Victorias second book and continues the story of the chronicles of the tree begun in her first book Tymons Flight. Second books in a trilogy are usually that empty zone of story and/or character development as the author manoeuvres the principal characters and events into position so that the big set-piece showdown between the heroes and the villains can happen. Not so in Samihas Song where not only do new principal characters come into play but the characters, most notably Tymon the hero of the first book, grow and mature as people. Neither is plot left sleepwalking through stock action scenes or standing in the wings rehearsing its lines for the final book  twists and turns aplenty occur. All of which makes Samihas Song a rare and tasty morsel in the pantry of fantasy trilogies. Nor are those wanting to leap straight into the story, by-passing the first book, left scratching their heads as to how the action got to where it is now. 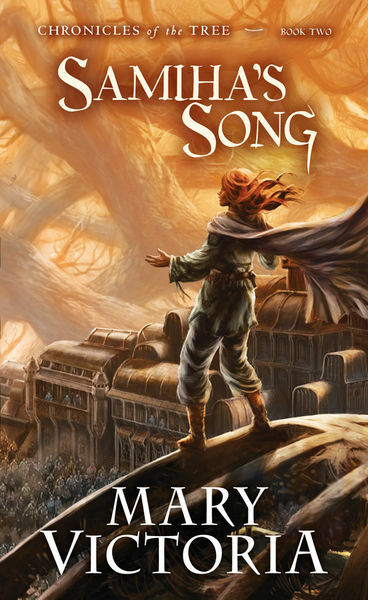 However, unlike Tymons Flight, Samihas Song does not stand up well as a standalone book as although the action finishes at a natural hiatus the storys end is left hanging. If from the forgoing you believe that I enjoyed Samihas Song then you would be right in a tepid way because enjoy is too weak a word to describe my reaction to this book. I was shock and elated, surprised and annoyed, and left deeply craving book three so I could carry on the saga straight away  which I consider a sign of good writing. This means I have high expectations for the concluding volume, but fortunately from what I have read so far I very much doubt I shall be disappointed.